The Internet of Things (IoT) ecosystem will gain new momentum next year, as the underlying technologies are deployed in new use-cases. That being said, 451 Research released their latest market study findings that highlight the key challenges facing this emerging sector. According to their assessment, 46 percent of enterprise leaders expect to have IoT applications deployed by year-end 2016. These savvy executives are are already seeking guidance from qualified consultants that have proven IoT and M2M experience. While communications protocols, security, competing WAN approaches and data management remain concerns, the early adopters are focusing on the business process changes that are required to fully exploit Internet of Things opportunities. Pricing for IoT components is rapidly declining, bringing IoT deployments into reach for a larger addressable market. Security of IoT continues to be a source of major concern for early IoT adopters as they connect previously unconnected industrial OT systems. 451 Research analysts believe that IoT has reached an all-time high in mind-share, there are also a growing number of production deployments -- ranging from industrial automation, enterprise, commercial automotive fleet and a variety of other applications in the consumer market. 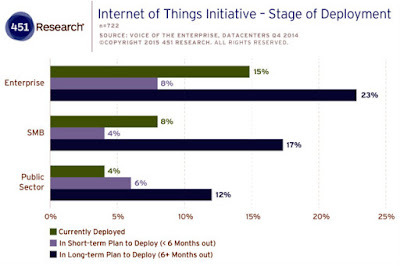 Many more organizations are planning to evaluate and deploy IoT technologies in the coming year. Fifteen percent of the large enterprises surveyed have already deployed some form of IoT technology, while another 31 percent plan to do so in the next 6-12 months. Moreover, the IoT market is a hotbed of merger and acquisition activity, with more than $23 billion invested in 94 IoT-related transactions within the last 12 months, according to the 451 Research study. emerging sector, 451 Research has created a dedicated Internet of Things research channel. We'll share more details from their ongoing market research, as they become available.